Are you get bored with your default ringtone? And finding how to change ringtone in Windows 10 mobile? Then you are in the right place. Here we will learn how we can make custom ringtones for windows phone in just a few minutes. I know it’s an amazing feeling when your phone rings with your favorite song ringtone. Then why to refrain yourself from setting your favorite ringtone in your Windows 10 mobile? The simplicity and the features of Windows 10 mobile are always impressive. But sometimes users found some settings difficult to understand. In this guide, I will share the easiest and the smartest way to make your own free ringtones for windows phones. Without ringtone, you will surely miss notifications of many of your important calls. But, what when you have to listen that ‘by default set’ ringtone for every incoming call? So, I am going to present 3 ultimate methods to change ringtone in Windows 10 mobile. Also, we will learn how to make your own customize ringtone in Windows 10 mobile? The best thing about the article is, that we can use these methods to change ringtone in Windows 8 phones also. ALSO READ: How To Use Remote Desktop To Connect To A Windows 10 PC? But I will recommend reading the full idea to avoid any kind of doubts and mistakes. So let’s see the 3 step-by-step, latest methods to change ringtone in Windows 10 mobile. Windows phones come with a number of pre-loaded ringtones. But, sometimes it’s very puzzling to change these system ringtones. The first method work for the users who want to use pr-loaded system ringtones in Windows 10 mobile. This will be the simplest way to change ringtone in Windows 10 mobile. We gonna use’built-in settings‘ to change system ringtones in Windows 10 mobile. Into the personalization, Select Sounds. Here, you will see preloaded Windows 10 Ringtone Sounds. Choose any one of these as your Windows Mobile ringtone. Yes, we have successfully changed Windows 10 ringtone. And learn how to change ringtone in Windows 10 mobile with the help of Windows mobile built-in settings. Our next method will be for the users who don’t want to use pre-loaded system ringtones. 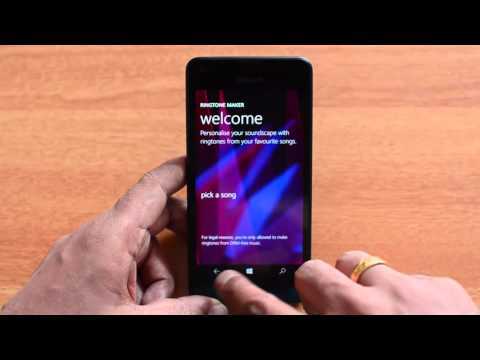 Follow the next step if you want to set your favorite song as your Windows phone ringtone. A single USB can change your boring ringtone to your favorite one. Yes! you heard it right. Microsoft Windows 10 phones also provide the features to change ringtone with the help of a USB cable. For this, you will only need to turn your PC/Laptop on and connect any USB cable in it. Step 6. Now your selected ringtone is in your Windows 10 mobile. You can set it as your ringtone anytime. Now, Enjoy your desired ringtone on your Windows 10 mobile. But, If you don’t have PC, it doesn’t mean you can’t set your selected ringtone on your Windows 10 phone. Yes, you can still insert your desired MP3 song as your ringtone, by following the next method described below. The next method is very convenient for them who don’t have a PC or a laptop to process the second method. In the next method, we will learn how to change ringtone in Windows 10 using the Ringtone maker app. Ringtone maker app is the custom ringtone generator app from Microsoft. It comes pre-installed with every Windows 10 mobile phones. If it is not available with your Windows 10 mobile, you can download it easily from the Windows app store in a few seconds. We can set our custom ringtones with the help of the Ringtone maker app. Also, this provides us with one more ease to crop any song and make the ringtone of it. So, Let your phone rock out to your ringtone by using ringtone maker. Ringtone maker for Windows Phone is an awesome way to edit the selected MP3 song. This free MP3 ringtone converter software is for anyone who loves to set new ringtones and have a Windows phone. Open the app and select the song. Now we know, how to change ringtone in Windows 10 mobile. You can change or create any custom ringtone in Windows 10 mobile anytime you want. Now we know how to set custom ringtone with the help of a USB cable. We know how to use ringtone maker app. So, Flash your stylish and modern personality in front of your friends by updating the latest ringtones. Also share on Facebook, Twitter and, other social sites. In case you have any difficulties please do not hesitate to comment.